Since childhood, you’ve been bombarded with the better safe than sorry rule. What better time to apply that idea than when dealing with time-intensive, valuable plans? We can scan your drawings and save them to disk, so your plans are safe, even if your printed documents are lost or destroyed. 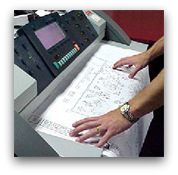 Give us a call today, and let us help archive your printed plans in a safer place.